Explanation: Q: Why are black holes black? A: Because they have an event horizon. The event horizon is that one-way boundary predicted by general relativity beyond which nothing, not even light, can return. 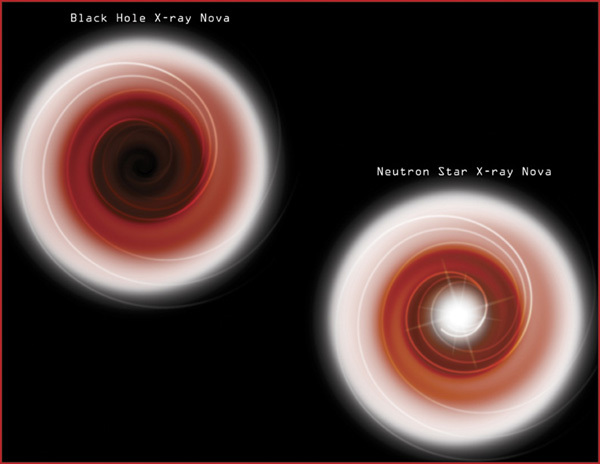 X-ray astronomers using the space-based Chandra Observatory now believe they have direct evidence for event horizons - therefore black holes - in binary star systems which can be detected in x-ray light. These binaries, sometimes called x-ray novae, are known to consist of relatively normal stars dumping material on to massive, compact companions. As illustrated, the material swirls toward the companion in an accretion disk which itself glows in x-rays. If the compact companion is a neutron star (right), the material ultimately smashes into the solid surface and glows even more brightly in high energy x-rays. But if it is indeed a black hole with a defining event horizon, then the x-ray hot material approaches the speed of light as it swirls past the surface of no return and is lost from view. Recent work describes observations of two classes of x-ray binaries, one class 100 times fainter than the other. The results imply the presence of an event horizon in the fainter class which causes the extreme difference in x-ray brightness.